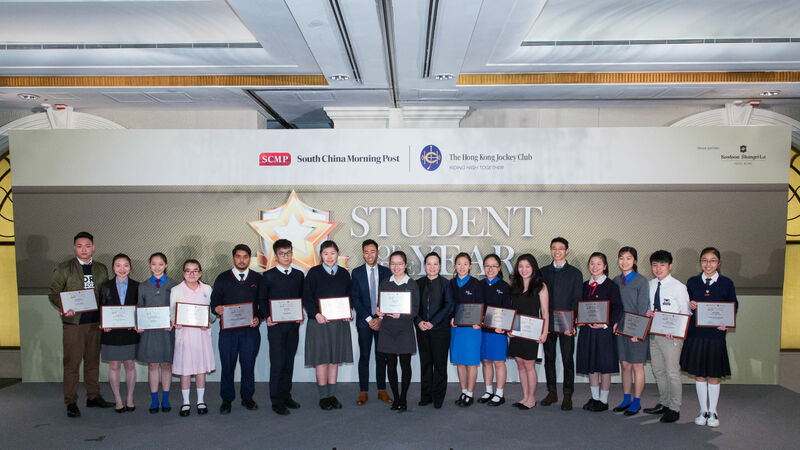 HONG KONG, 3 March 2017 – Nineteen exemplary Hong Kong secondary school students have been acclaimed by the Student of the Year Awards, the most prestigious secondary school event in Hong Kong and organised by the South China Morning Post. The students received the honours at the awards presentation ceremony on Saturday (25 Feb), which was graced by the Guest of Honour, the Honourable Rimsky Yuen Kwok-keung, Secretary for Justice, HKSAR. Solely sponsored by The Hong Kong Jockey Club for the fourth consecutive year, the Student of the Year Awards conferred the accolades on the students in recognition of their achievements in academic subjects, linguistics, sports, performing and visual arts, science and mathematics, as well as contribution to community service. The scope of the Awards was expanded this year with two new awards – “Best Devotion to School” and “Best Improvement”. The winning students went through several rounds of stringent group discussions, auditions, interviews and other forms of assessment adjudicated by a number of subject experts. Over 650 nominated students from Form 4-6 / Grade 10-12, recommended and endorsed by their principals and teachers from over 150 schools in Hong Kong, vied for the top Student of the Year Awards glories. In addition to the judging panels, the Awards also received guidance from the Advisory Board which consisted of the following Hong Kong leaders – the Hon. Bernard Charnwut Chan, Hong Kong Deputy of the National People’s Congress of the People’s Republic of China and Member of the Hong Kong Government’s Executive Council; Mr. Winfried Engelbrecht-Bresges, CEO of The Hong Kong Jockey Club; Mr. Lau Ming-wai, Chairman of Commission on Youth; Mr. Gary Liu, CEO of South China Morning Post Publishers Ltd and Dr. Allan Zeman, Chairman of Lan Kwai Fong Group. The Awards are also indebted to the support extended by the Education Bureau. “The South China Morning Post continues to be proud of the small part we play each year in discovering, encouraging, and celebrating Hong Kong’s outstanding young talent, and the enviable future of this city,” remarked Mr. Gary Liu, SCMP CEO, at the awards presentation ceremony. “I sincerely congratulate the winners and nominees of this year’s Student of The Year awards. They have shown a drive to excel and a tenacity for success. But most importantly, they have shown us the ‘humanity in achievement’.” Mr. Liu encouraged students to be continuously mindful of making the world a better place through their achievements. Form 6, Madam Lau Kam Lung Secondary School of M.F.B.M. The Student of the Year Awards acclaim this year’s winners with members of the Advisory Board, representatives from The Hong Kong Jockey Club and the Education Bureau, and Guest of Honour the Hon. Rimsky Yuen (9th from left, front row), Secretary for Justice of Hong Kong. Awardees of the Student of the Year Awards celebrate their wins with Mr. Gary Liu (8th from left), SCMP CEO; and Ms. Scarlette Leung (9th from right), Executive Director, Corporate Planning, Communications and Membership, The Hong Kong Jockey Club. South China Morning Post Publishers Limited is a leading newspaper and magazine publisher in Asia. Its flagship publication, the South China Morning Post, is Hong Kong’s internationally recognised English language newspaper and has the city’s most affluent and influential readership. First published in 1903, the newspaper has developed an enviable reputation for authoritative, influential and independent reporting on Hong Kong, China and the rest of Asia. Available in print, mobile, tablets and online through scmp.com and e-reader editions, the South China Morning Post reaches a global audience with daily breaking news, analysis and opinion, multimedia articles and interactive forums. The South China Morning Post received 200 awards in 2015-16 for excellence in editorial, marketing and technical capabilities. Other titles in the company include the Sunday Morning Post, STYLE, Destination Macau, and The PEAK. SCMP PUBLISHES SANDS STYLE IN PARTNERSHIP WITH SANDS CHINA LTD.